The Wall Street crowd got all lightheaded last week because Facebook posted some better than expected numbers. Pardon me if I don't join in the champagne shower. Here in the Ivory Tower wing at The Ad Contrarian Worldwide Headquarters, we're starting to think that Facebook may turn out to be one of the all-time dumbest companies on the planet. And remember, to be the all-time dumbest you have to be dumber than Pepsi. That ain't easy. I'm the farthest thing from a digital strategist, but I have this feeling that Facebook's business strategy is all wrong. Facebook is the only media company in the universe that reaches a billion people on a regular basis but seems determined to sell cheesy $2 ads to dentists. To understand the problem with this we have to go back to first principles. We have a couple of axioms about advertising that are relevant to this issue. The first is that interactivity is the enemy of advertising. Whether the interactivity takes the form of clicking a tv remote, pushing a radio push-button, clicking a mouse or swiping a page, we believe that people are far more likely to interact with a medium to avoid advertising than to engage with it. You can read more about that here. Second, we believe that online advertising has turned out to be far better at fulfilling demand than at creating demand. This accounts for the success of advertising on sites like Google and Craig's List, where people are searching for something. It also accounts for the failure of most display advertising. You can read more about that here. The exception to the first axiom is found in the second axiom. People will purposefully interact when they are looking for something -- when they are in "demand fulfillment" mode. In this mode, people will engage with advertising. When they are not in this mode, they will avoid. Somehow Facebook seems to have gotten the idea that they are like Google. They are using a "demand fulfillment" business model -- crappy little listing ads that only "searchers" would find appealing -- to monetize "demand creation" advertising -- which requires big, impactful, and atttractive ideas. Maybe this brilliant graph will help. The way you make big ad money in the "demand creation" model is in the upper right quadrant. You sell big, impactful ads to broadly targeted advertisers. 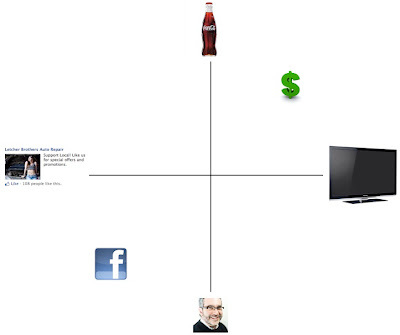 The way you make money in the "demand fulfillment" model is in the lower left quadrant. You sell a million crappy little ads to dentists. This is how the yellow pages and the classifieds used to do it, and how Google now does it. Facebook is a "demand creation" medium stuck in a "demand fulfillment" quadrant. According to Facebook's coo, they have so many users, it's like three times the Super Bowl audience every day. But do you see the Super Bowl crowd there? Do you see Coke and Budweiser and Doritos? No, you see pet groomers and divorce lawyers. This is because they are selling the wrong stuff to the wrong people for the wrong reasons at the wrong price. Other than that, they're doing fine. In our next exciting episode, we'll talk about why Facebook's focus on mobile does not solve this problem; why their emphasis on precision targeting is all wrong; and why they need to do something different and radical. Maybe we'll also find out why if I'm so f/ing smart, how come they're all billionaires and I'm a schmuck with a blog? Stop giving it away. There are agencies that would love to charge Facebook a zillion dollars to tell them this stuff and make ads about chairs for them. Axioms don't really have exceptions. Other than that, very good. I think that's why Facebook's latest business model is to be the Google of the Third World. Totally agree with your analysis. There is no 'there' there, no practical business model to monetise all that traffic. As you clearly point out, it's not a 'display' medium (ads that come to you) but it's not a 'classified' (ads that you go to)medium either. So advertising doesn't work on FB but they can't charge subscription fees without creating a rush for the exit. How will they pay the server farm elecricity bills? I have a feeling that underpinning all of this is the 'social' nature of the channel. People use it as a private/personal/social tool. They don't necessarily want it to become commercialised. So ads on FB are a bit like the Amway guy at the party ... or sponsored stationery! I got involved in a debate on another site around the time of the IPO, and my observation was that the listing was for the people who had funded its development to get their money OUT, not put money IN. They were selling because they knew the truth. Those who bought were buying the hype about a billion users. The massive sell-off of stock from FB insiders since then has only served to confirm my opinion. I have read that Facebook is now charging businesses to communicate with their "friends" or "followers"--sort of a weird form of blackmail. I'm sure that's going to go over like a turd in a punchbowl. Facebook is now charging us businesses to promote our posts, in order for all our followers to see the "content." There are lots of complaints, especially from the big publicity accounts (George Takai, for example has 1,000s of followers but isn't really selling anything). It's going over like a lead balloon, and will most likely be modified soon. But at some point they need to figure out a revenue model for the standard posts we make, since we ain't about to buy the ads. I'd pay a bit: Facebook allows me to communicate with thousands of fans of my business. For free. I'd pay a little for a service to send them email, so a small payment to the platform seems reasonable. They just haven't figured it all out yet. Facebook is a viable advertising medium but the long term value/price of advertising on the platform has not settled. Facebook (aided by their financial advisers for their IPO) overstated the sustainable long-term price of their advertising. Why? To maximise founding shareholders' personal benefit from the IPO. Since then the shareprice has tumbled because the world is gently being allowed to wise up to the fact that Facebook advertising isn’t anywhere near as valuable as was suggested in the prospectus. But let’s imagine that Facebook advertising is worth only one quarter of the average price currently being paid. Does that mean that Facebook is now unviable as a business? No. Does it mean that ad revenues from a 1Bn+ user base will be trivial? No. It’s a good business with a bright future – just not worth anything like the money paid by investors at the time of the IPO. Suckers. Facebook’s greatest asset is that it has extremely intimate information about a huge number of people on the planet. They don’t currently make this available to advertisers, mostly because advertisers would abuse it, partly because it would freak people out in terms of privacy. I think FB are still casting around for a revenue model for this data. It may sound trivial but using FB data to augment credit scoring would be a massive money-spinner. Experian turns over 5 billion per annum. My view is that advertising may not be the commercial ‘point’ of Facebook, so looking at it through that lens will make it look like it’s on the wrong track. Friends of mine who spend spend time with people from Facebook (and people from other silicon valley megacorporations)always comment about the contempt they have for the advertising industry. FB is here to destroy the advertising industry, not create a new platform for it. I've yet to see any evidence that the internet is a medium that can create demand anywhere near the scale that big advertisers need. So how could FB possibly defy gravity in a way nobody else does? If they were able to do so, they wouldn't be Facebook anymore. Yes they have a billion sets of eyeballs on an occasional basis, but unlike the Superbowl, those eyeballs are looking in a billion different directions. Facebook Trying To Commit Suicide?